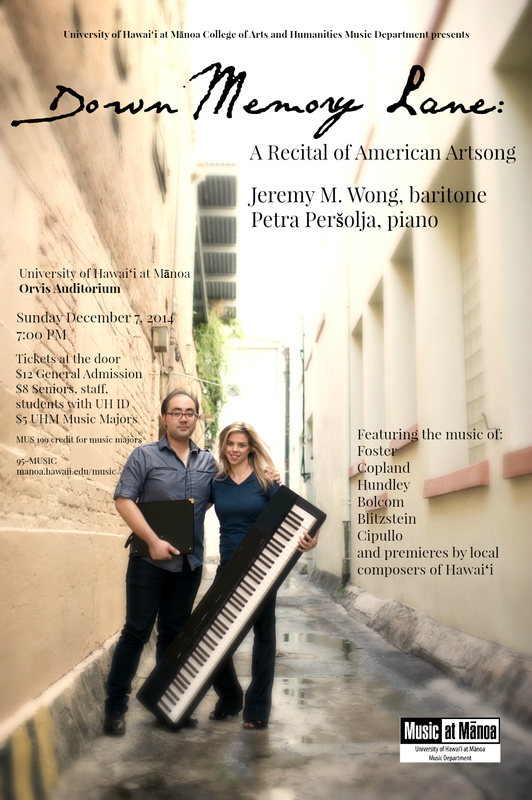 Baritone Jeremy Wong and pianist Petra Peršola will present an evening dedicated to experiencing the often-unexplored world of American art song. Music by established composers and songwriters Stephen Foster and Aaron Copland will be sung, as well as living composers Richard Hundley and Tom Cipullo. There will be a foray into the world of the cabaret and early musical theater/opera in the form of William Bolcom and Marc Blitzstein. Finally, the recital will showcase local living composers of Hawai‘i, with performances and premieres by composers Daniel J. Bayot, and William Watson.